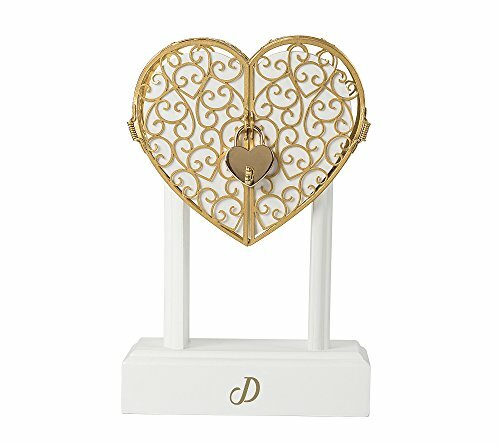 Symbolize your commitment by "locking your love" in a beautiful display with the Personalized Heart Vow Unity Keepsake. A white wooden heart box holds the vows and is placed inside a golden metal frame, which features a lock and key design inspired by the Pont des Arts Bridge in Paris. Resting on top of an elegant stand, the heart vow unity is the perfect wedding gift to preserve your written promise. Stand: 6" L. x 3" W. x 6" H. Metal Heart: 5.5" L. x 2.5" W. x 5" H. Lock: 1.125" L. x .1875" W. x 1.5" H. Key: 1" L. x .125" W. Inside White Heart: 5" L. x 2.5" W. x 4.5" H.